Regular readers may by now be accustomed to my wandering off along side tracks. This month I’ve ended up in Bermondsey. I say ‘ended up’ because my principal interest was Deptford which lies to its east, but one of my passions is street maps. In the unlikely event I’m ever invited on to Desert Island Discs I might choose an A-Z of London as my castaway book. I confess I owed my image of Bermondsey to Charles Dickens and Oliver Twist. A place of slum housing, disease and degradation, a London suburb left behind by dock closures and changing times. But looking at a map I noticed words like ‘abbey’ and ‘spa’ and ‘grange’, names which suggested a more picturesque history than I’d ever realised. And that was the start of this month’s wander. 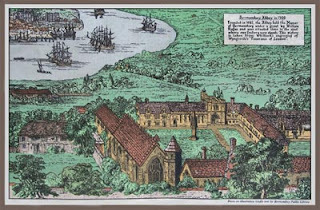 Bermondsey did indeed have an abbey, St Saviour’s, founded by Cluny monks and a favourite place of retreat in Medieval London. Henry V’s Dowager Queen Catherine died there in 1437. She may have gone there for spiritual sustenance, or perhaps to be delivered, discreetly, of yet another child by Owen Tudor. Elizabeth Woodville, the Dowager Consort of Edward IV and mother of the Princes in the Tower died there too, in 1492. One can imagine that after a lifetime amid violence and treachery she welcomed the bucolic peace of a country monastery. Bermondsey was a village, with a little mill stream, the Neckinger, that ran from the Thames to the Abbey gardens. The Neckinger is underground now, like so many of London’s streams, but the name lingers on. You’ll find it on a modern street map. And the Abbey? Demolished by Henry VIII. Of course. Water shaped Bermondsey in so many ways. The Thames at that point is tidal but the water is sweet not salt. It was a perfect location for leather tanning and the smelly trades associated with it, hide-dealing, parchment-making, glue-boiling. One of Bermondsey’s many tanneries, the Grange Tannery, was a reminder, by way of its name, of the village’s religious past. 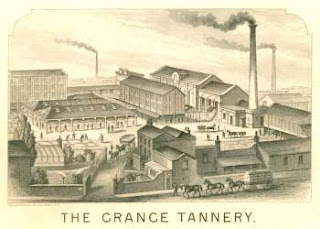 The grange would have been the abbey’s granary, a storehouse for its own crops and for tithes paid in kind. Don’t you love connections? But it was the idea of a spa in grimy old Bermondsey that particularly interested me. In the 1770s a gentleman called Thomas Keyse discovered a chalybeate spring in his Bermondsey garden. Chalybeate waters were recommended for the cure of colic, melancholy, hysteria, clammy humours, flatworms, and moisture on the brain. Mr Keyse, an artist with entrepreneurial flair, acquired a music licence and opened his gardens to the public, a shilling a head. That’s 5p to you, dear younger reader. Sometimes he put on firework displays. I expect he charged extra for that. Mr Keyse’s spa lasted only thirty years or so, but it is memorialised in a street name, Spa Road. So much of Bermondsey’s history is. Leathermarket Street, St Saviour’s Estate, Tanner Street, Morocco Street, Abbey Street, Millstream Road. And now Bermondsey is enjoying a revival. Fashionable waterfront restaurants, warehouse loft apartments, boutique hotels, and to top it all the Spa Gardens have reopened, 21st century-style, with a designated dog-walking zone and user-friendly park furniture. On Abbey Street there’s an Internet café, a launderette and a convenience store. I wonder what the Cluny monks would have made of that? Wonderful post. It seems almost miraculous that street names preserve so much - fascinating! I've worked at London Bridge for the past eight years (down the road from Bermondsey) and always wondered why the road at the back of Guy's Hospital was named Snowsfield... I found out relatively recently it has absolutely nothing to do with snow, funnily enough (we don't get that much of it in central London!) but it was one of the places where tanned hides were pegged out to dry/cure. Apparently they looked pale enough that they were thought to look like snow, which makes the name strangely less picturesque now...! If only there were somewhere one could conveniently go these days for melancholy, hysteria, clammy humours, flatworms, and moisture on the brain! Holland & Barrett do not quite do the job. My home ground! Have fun on your way to Deptford. There are the joys of Mayflower Pub to come and the amazing St Mary's with a bishop's chair made from timber salvaged from The Fighting Temeraire and the grave of Prince Lee Boo. In fact, I think I might go for a walk along that way now and pay my respects. Snowsfield... I missed that one! Many thanks, Jencat. Crimea is a magic piece of the world, but hotels are rather expensive there. If you need a cheap accommodation in Crimea, it is better to rent an apartment. I gathered some contacts in my directory http://ukraine-vacation-guide.com/dir/apartments/crimea/135 to facilitate people’s search of Crimean apartments. If you know other good accommodation, you can submit it to the directory as well.